On the 26th of October during the plenary session of the European Parliament in Strasbourg, Members adopted the ENVI Committee motion for a resolution on transfat in processed food, calling for mandatory limits on industrially-produced trans-fatty acids (TFA) to limit their intake in Europeans and help prevent risks of cardiovascular disease, infertility, Alzheimer’s, diabetes and obesity. Led by eight MEPs (Mrs Lynn Boylan, Mrs Daciana Octavia Sârbu, Mrs Renate Sommer, Mr Nikolay Barekov, Mrs Anneli Jäätteenmäki, Mr Martin Häusling, Mr Piernicola Pedicini, Mrs Mireille D’Ornano) the motion passed by 586 votes and was welcomed amongst the EU health advocacy organisations. The draft motion for resolution highlights that TFAs are a priority issue for the European Parliament and stresses Members’ concerns over the public health risks posed by TFAs, while evidence has shown that limiting TFAs has the potential to drive significant health outcomes. Building on statistics from the European Commission, the motion stresses that only one in three consumers in the EU is aware of TFAs, which shows that labelling measures are not enough. In this regard, MEPs call on the European Commission to set an EU legal limit on industrial transfats, “as soon as possible” and preferably within two years. They also refer to the situation in Denmark where the introduction of a national limit of 2% on transfats in oils and fats in 2003 significantly reduced mortality rates related to cardiovascular disease. The European Commission has started to conduct an impact assessment which should be presented in Q3 2017 with a proposal for an initiative expected by the end of 2017. 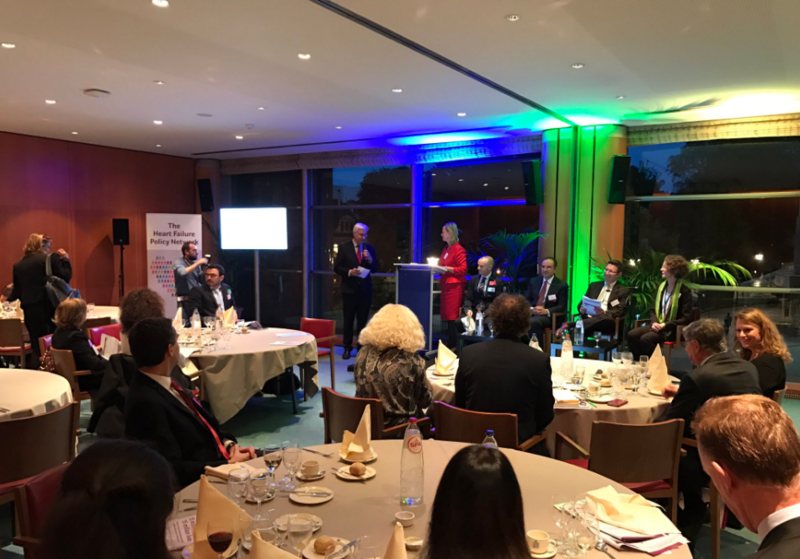 Prof. Vanholder and the EKHA Secretariat participated in the event “15 million hearts, 15 million lives” on the 19th of October in the European Parliament. 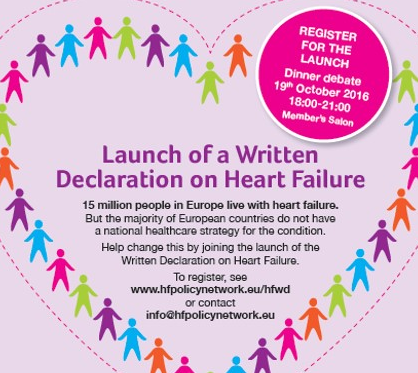 Hosted by Mrs Annie Schreijer-Pierik – member of the MEP group for kidney health – the event marked the launch of a European Parliament written declaration on heart failure. Heart Failure represents a significant burden for kidney patients, as major studies have shown the very close links between both organs. The prevalence of heart failure increases greatly as a patient’s renal function deteriorates and is even higher at end-stage renal disease. Similarly, heart failure is a major cause of chronic kidney disease since it is often correlated with a gradual and rapid decline in renal function. In addition, as for all major chronic conditions, heart failure and chronic kidney disease share similar risk factors such as high or excessive salt intake, hypertension, obesity or overweight; which can be addressed through a common preventive approach. The event was the occasion to hear about the findings of a state of play report in the diagnosis of heart failure, discuss the revised 2016 guidelines on heart failure developed by the European Society of Cardiology, as well as discuss next steps in the response to heart failure. Mrs Ingrid Keller from the European Commission DG SANTE provided an overview of the EU approach in preventing and managing chronic diseases, and gave insights on the way forward. This includes activities in the scope of the European semester process, the EU health policy platform to foment dialogue between policy makers and interested EU stakeholders, or the upcoming start of the CHRODIS + Joint action, strengthening the efforts and outcomes achieved under the current Joint Action CHRODIS which ends at the end of the year. Contributing to the event, MEP Karin Kadenbach – co-chair of the MEP heart Group and Chair of the MEP Group for Kidney health- noted “We can do more: Article 168 says the health of European citizens is a shared responsibly …therefore it is a shared competence”. In the scope of the campaign led by PHA Europe to improve Organ Donation and Transplantation across the EU, EKHA contributed to the event “Improving organ donation and transplant across the EU: A cross-condition campaign” held on the 18th of October in the European Parliament in Brussels, under the auspices of MEP Hilde Vautmans, MEP Ivan Jacovcic and MEP Alojz Peterle. The event was the occasion for all interested stakeholders from EU policy makers to healthcare professionals, patients and health advocacy organisations to discuss ways to improve organ donation and transplantation across the EU, looking at the regulatory and logistics aspects of organ donation and transplantation as well as at the medical and awareness components. Participants and speakers outlined the low awareness of Europeans on organ donation and transplantation and the need for pan European campaigns to raise awareness and increase the availability of organs in Europe. Speaking on behalf of the European Commission, Mr Stefaan van der Spiegel, team leader for substances of human origins at DG SANTE gave an overview of the EU approach on the issue. While stressing that the EU competency in the field related to the quality and safety of organs intended for transplantation, he noted that the European Commission was committed to support awareness raising activities at national level, support the training of specialised professionals and the exchange of best practices, which is the aim of the new pilot project on organ donation and transplantation EDITH “Effect of Differing Chronic Kidney Disease Treatment Modalities and Transplantation Practices on Health Expenditure and Patient Outcomes” which will start soon and for which ERA-EDTA Registry is leading Work Package 4. He stressed that the mid term evaluation of the EU Action Plan on organ donation and transplantation will be completed by mid-2017. 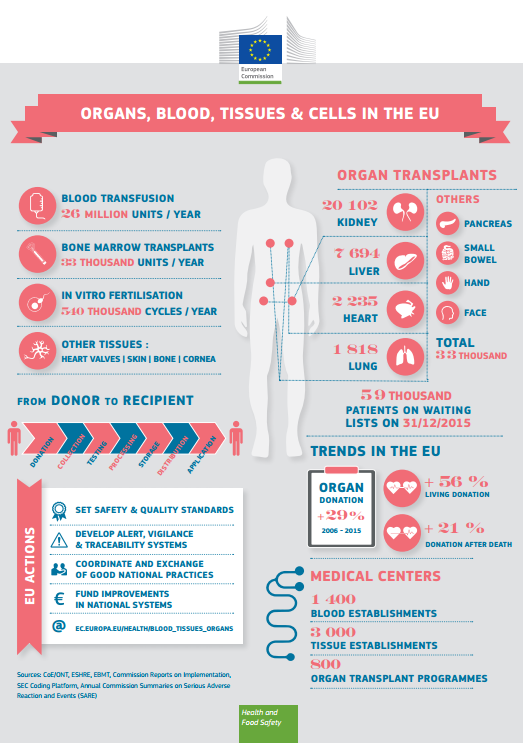 He also shared the European Commission new infographic on organ donation and transplantation which was released on the occasion of the European Organ Donation Day. Amongst the discussions were outlined the need for greater dialogue between health professionals and patients pre and post transplantation, the need for greater training of emergency doctors and intensive care physicians and the need for increased cross-border multistakeholder collaboration to deal with the challenge. She further noted that the time when the family is approached for consent to donate organs of a deceased family member is essential and that training facilitators who engage in dialogue with families is key. Mrs Hélène Le Borgne, Policy officer in the Unit for cross-border health care and former policy officer responsible for organ donation and transplantation, highlighted the importance of raising awareness on organ donation via the media and explained that the European Commission also promotes awareness building for communication officers via dedicated workshops. Prof. Vanholder, EKHA Chairman, was invited to provide insights on EKHA activities in the field, and gave developments on the challenges and options for change linked with organ donation in Europe, referring in particular to the different consent systems for organ donation and the need for awareness raising amongst the general public. MEP Peterle especially underlined the need to raise an organ donation culture in Europe. Watch to MEP Peterle giving his views on the issue here. Concluding the meeting, MEP Jacovcic informed of the launch of a written declaration on organ donation and transplantation in the coming months. While one of the priorities of the upcoming Maltese EU Council Presidency in the health field will be childhood obesity, the country will work to review the EU Child Obesity Plan 2015-2020 to assess the state of play and accelerate actions needed. The Maltese Presidency will also propose to EU Member States voluntary guidelines for the procurement of healthy food products in school canteens. The objective of the guidelines would be to provide recommendations which all health advocates could build on to support action at regional level or in schools to introduce healthier diets. 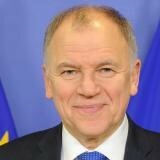 On the 18th of October, EU Health Commissioner Vytenis Andriukaitis shared a message on organ donation to mark the European Organ Donation Day. Referring to organ donation as a “gift of hope”, he reminded of his experience with the first even heart transplant operation in the Baltic States, as a cardio-surgeon in 1987. Thanking organ donors and their families as well as transplantation professionals in Europe, he also invited EU citizens to consider donating their organs and called on them to discuss and raise the issue with family and friends, to initiate reflection.